Beyond the Box One Rockwell ends the Summer with a Bang! Summer is almost over and Beyond the Box One Rockwell branch is treating us with great deals as the summer ends! 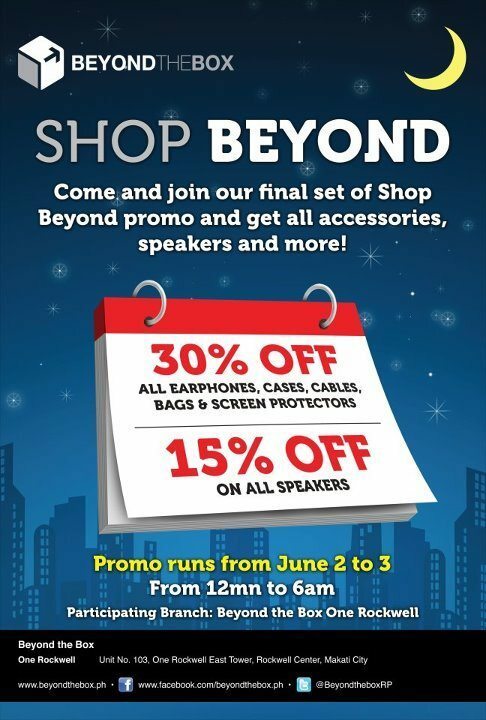 Beyond the Box is giving it all out as they offer 30% off on all of their earphones, cases, cables, bags and screen protectors. A 15% off will also be offered on all of their speakers! This promotion will be running from June 2 to 3 and you can take advantage of this great deal when you shop from 12am to 6am. Come and visit Beyond the Box One Rockewell branch now or go to Beyond the Box’ official Facebook Page to know more about this exciting promotion! *Beyong the Box One Rockwell branch is located in Unit No. 103, One Rockwell East Tower, Rockwell Center, Makati City. Previous Post: « Are you the Happiest Pinoy for 2012?